Pittsboro, NC – Two developments on opposite ends of Chatham would change the landscape and the economic character of the county. What do you think about it? On the west side of the county, just past Siler City, is the Chatham/Randolph Megasite. It’s a huge tract of land suitable for automobile manufacturing. Yes, autos. Right here in North Carolina. South Carolina has auto manufacturing (BMW). Tennessee has Nissan and VW. 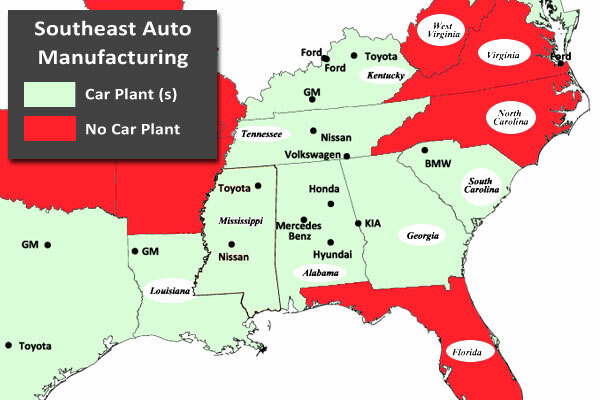 Alabama has 4 car plants. Southeast Auto Manufacturing Map adapted from Mississippi.org. North Carolina has no automobile manufacturing, so this is big news. The site is being pre-qualified as we’d say in real estate by Duke Energy. Car factories use a lot of energy, and availability of resources is a big plus for this site. The Chatham/Randolph megasite is just north of the Siler City Airport and covers more than 1,700 acres. A small portion crosses into Randolph County, hence the name. A typical auto plant might employ a couple of thousand workers when it gets up to full speed. But competition is fierce, both from other NC sites and across the region. On the eastern side of the county, right here in Pittsboro, plans are being made for a development called Chatham Park. If you think the Megasite was huge, Chatham Park will knock your socks off – more than 7,000 acres. 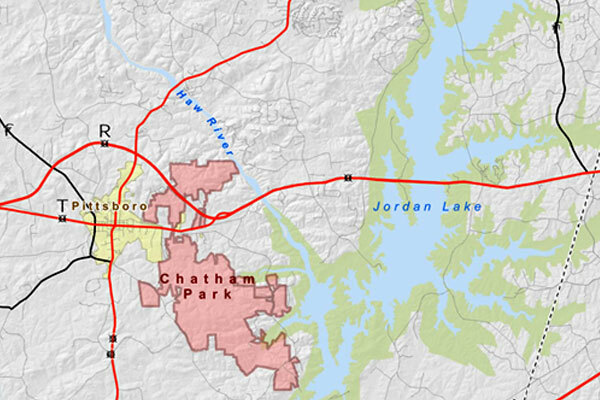 Chatham Park would occupy the land to the east of Pittsboro – between the town and Jordan Lake. Chatham Park is designed as a live-work-play community – an extension of RTP around the west side of Jordan Lake. But with housing. Lots of housing. Potentially 50,000 people. Current population of Pittsboro: 3,781. Another 2,983 in the ETJ (outside of town). So, less than 7,000 people no matter how you count it. So have called it the Cary-fication of Pittsboro. Reinforcing that idea, Preston Development is a Cary company backed by Dr. Jim Goodnight, the founder of SAS. What do you think about these two developments bookending Chatham County? It’s going to happen, as the land is there for development, and Jim Goodnight and others have been pondering development for a long time. 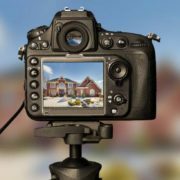 This will have a large impact on real estate development. As for me, I’d be looking for rental properties now.